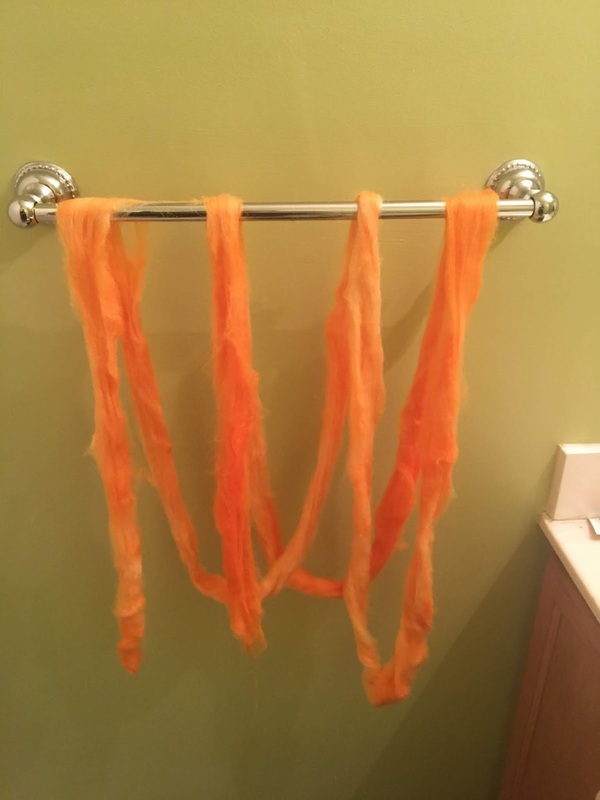 I first started my spinning adventure back in early december you can read my first post about it HERE and my second dive into spinning HERE . I bought a pound of wool for myself as a Christmas present since I have desperately wanted to spin more wool but didn't want to spend too much money for me to get in some good practice. I bought my pound off amazon from paradise fibers and when it arrived it was so soft and lovely. 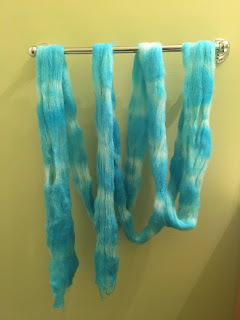 with all this new wool I wanted to try dying it but I didn't want to spend too much to dye it. looking around for other alternatives to expensive dyes I found people using kool-aid so after some more research I rushed to the store down the road and bought a bunch of different flavors. My first attempt at dying wool I used 4 oz of wool with 2 packets of red kool-aid and it didn't turn out too well. I vastly underestimated the amount of kool-aid I would need to use to turn it completely red so I ended up adding purple to it as well. It didn't turn out completely how I wanted. it will look really nice when it is all spun but as stand-alone wool, it's not the best looking. the second try turned out much better. Using two packets of orange kool-aid on roughly 2 oz of wool it came our pretty bright. 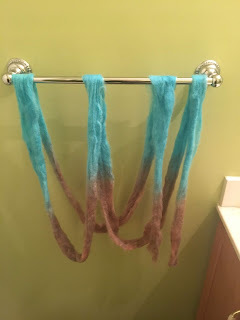 this was 4 oz I dyed while still in its crochet braid it turned out exactly how I expected it to and I love the overall final look of this one. I call it my cloud wool and I'm probably going to put off spinning this one for a while just so I can keep it around and be happy about how well it turned out. this was 2 oz and I let myself experiment with it a little bit I folded it in half 3 times and had one half in the blue kool-aid and one half in the purple it ended up being my favorite of all the wool I dyed. It's the one I am most looking forward to getting my hands on. 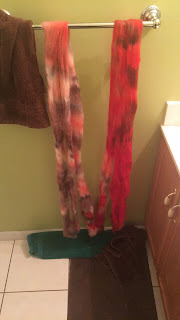 Overall I love all of the wool I dyed and learned so much from this experiment. I usually jump in feet first for everything I do but this was one thing I really tried to research to the best of my ability before I ran off and got the kool-aid, but now I know to absolutely make sure I have more than enough kool-aid. I don't end up with another one looking like my first one. Not that it looks completely terrible but I would love to avoid making that mistake again.